My last post gave some details about a detection method commonly used in GC, the FID. Another detector that is widely used for the analysis of volatile compounds, including at PhytoChemia, is the mass spectrometer (MS). Unlike the FID, the MS is a complex detector. Typically, in GC-MS (although other modes are available), when a compound to be analyzed enters the detector, it is first subjected to a strong electric current which splits it into electrically charged fragments. A stream of gas then carries the fragments between a series of magnets that generate a magnetic field. That magnetic field can attract the fragment to the walls of the detector, where it is neutralized, or rather lead it the detector which produces an electrical signal. The more fragments reaching the detector, the more intense the signal is. Depending on the frequency of the magnetic field, fragments that are more or less heavy will be allowed to cross the magnets, and their atomic mass will be known. As the magnetic field rapidly oscillates, the detector performs a full scan for fragments of all selected atomic masses several times per second. In GC-MS, the plotted chromatogram (Figure 1) is a sum of all the ions detected at a specific time. At any point in time, the spectrum can be inspected to extract the mass distribution of the detected ions. Figure 1. Data obtained during a GC-MS analysis. Above, the chromatogram, which is a sum of the number of detected ions of any mass at any given time. 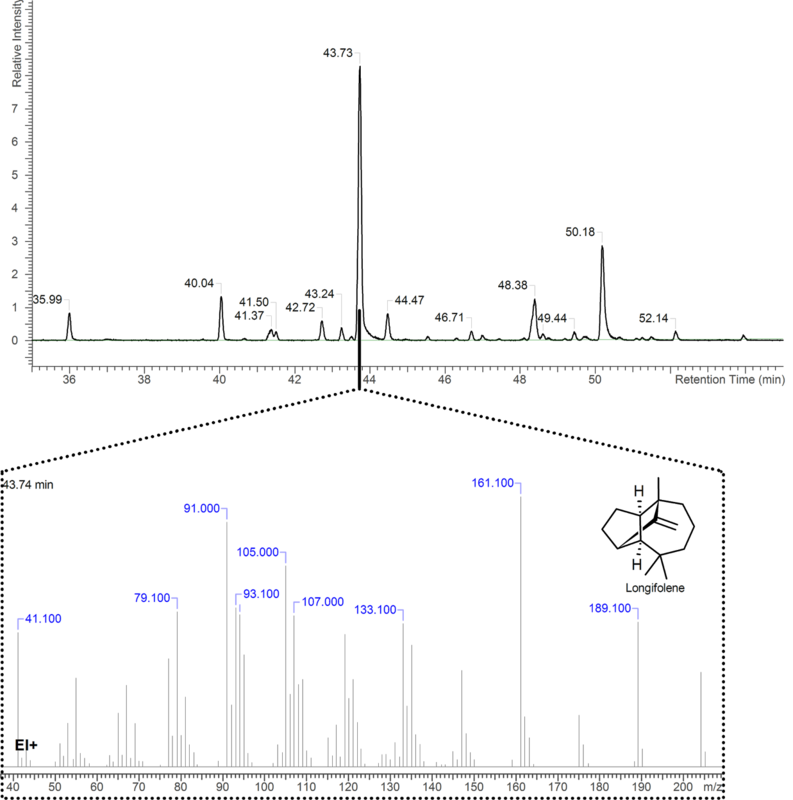 Below, the mass spectrum extracted at 43.74 minutes, which provides the mass distribution of the ions sampled at this moment. This spectrum can be used to identify the peak of the chromatogram, corresponding to longifolene. One must keep in mind that when we say that a compound reaches the detector, it is actually trillions of molecules that are broken simultaneously. Fragmentation does not occur purely randomly: some chemical bonds between atoms are easier to break than others. On several billions simultaneous fragmentations, fragments resulting from the cleavage of these weaker links will therefore be produced more often. Conversely, the more energy-demanding fragmentations are disadvantaged, and occur less often. In short, the mass spectrum above is a statistical distribution: the fragments whose intensity is the strongest are those most often observed when one breaks a large population of molecules from the analyzed compound. The result is a "fingerprint" which is relatively characteristic for a given chemical compound. This fingerprint, called a mass spectrum, can be compared to databases. The software compares the spectrum observed with thousands of reference spectra, in order to identify the molecular structures that are the most consistent with the observed signal. In short, MS is a powerful tool for identifying compounds: it is its primary use. As such, when facing an essential oil in which we struggle to identify all the molecules by our usual methods (a future post will explain this technique), the use of MS often solves the problem. But one has to pay attention to some pitfalls. Indeed, two different chemical compounds can produce very similar mass spectra. A database of mass spectra should never be used uncritically. It may also sometimes happen that a molecule is not part of the database. These are never fully complete, and it is even possible to stumble upon molecules that have never been previously identified (which implies that much more lab research will be required if the structure is to be found). Thus, the interpretation of a serious MS analysis involves looking at literature and concurrently using retention indices (see next post) to avoid confusion. In short, detection by MS can generally improve the proportion of identified compounds in an essential oil or a mixture of other volatile products, and provides lots of information on the structure of molecules. It is a valuable ally of the chemist, but should be used with caution.